The markets are down 400 points right now as I’m doing this recap. We are in a very choppy environment. What I’m finding is that this is not the time to swing for home runs. Right now, you got to go for base hits. One of the things I noticed in the last couple of days is that I’ve been taking these trades and I take a big position and then when I’m up 20 or 30 cents, I double my position. I’m adding to it and it’s because last month when I did that, I would then have two times the average size and when it continued higher, I’d make that much more. What’s happening this month is the stocks are hitting maybe 20, 30 cent high and then they pull back to my entry and now I’ve got a big position and I’m at breakeven and when I press the sell button, I get slippage. Slippage is what happens when you try to market out of a 15,000 share position and there’s just not a lot of buyers to absorb your shares. So what happens is the stock drops. So what it ended up, today for example, being a three, $4,000 winner turned into a $3,000 loss. Why did that happen? 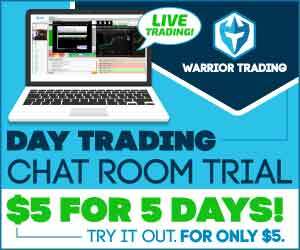 Why am I looking at all these guys in the chatroom who were profitable on the trade that I loss money on, it’s because I was too aggressive. That’s one of the things that’s really interesting. I know this happens for other students sometimes. They’ll be in the chatroom and they’re like, “Ross, we traded the same stock but we traded it totally differently.” Maybe I’m green on it. Well, today they’re green on it. It comes down to your emotions. It’s how are you trading today. Are you being really aggressive? Are you trying to swing for the fences or are you being more conservative and taking the 20, 30 cents when you have it? Well, today I decided to double and I’ve been doing the same thing this month and I got to slow down. I got to spend some time studying the big home runs in January because things will start to pick up again. When they do, I want to be able to really capitalize on it. My goal is to have my first $100,000 day. My best day of all time right now is $40,000 in the green. I think I’m capable of $100,000 day. So that’s my goal for 2018. But it means I need to go back and study some of the momentum stocks because when we start to see that tide change, when we start to see the momentum pick back up, I want to be ready to be there, pedal to the metal, get aggressive, capitalize on the opportunity and then when things slow down the way they’ve been right now, I got to ease up. I got to slow down a little faster. All right. So you can see my Mickey Mouse here so you maybe wondering why am I wearing these. I’m going to Disney World. 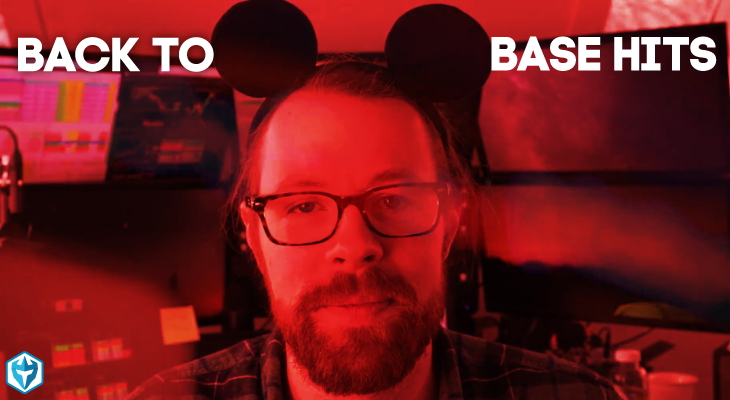 I’m going to Disney World in March and you can join me too. We’re going for a conference with all of our inner circle students. You can click the description below to learn more about our seminar. All right. 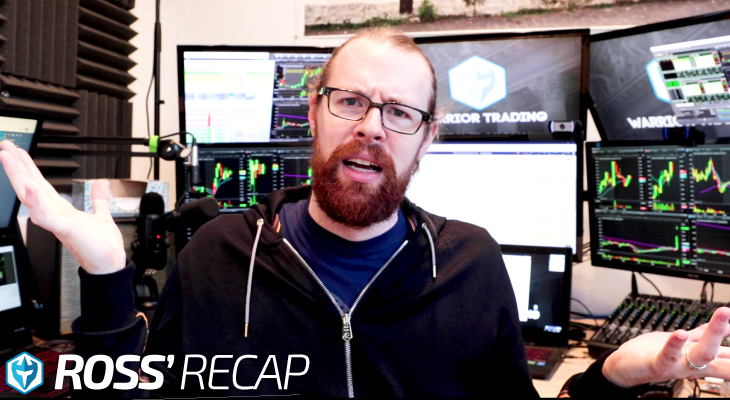 Now, let’s break down the trades from today on our midday market recap. All right everyone. So we’re going to break down the trades from the morning. Right now the market is down about 300 points and we’re seeing just continued weakness in the overall market which makes it a little tricky for us trading small caps, not because small caps really get big and up with the market but more because the greed and exuberance and that kind of feeding frenzy that we see sort of gets, I don’t know, it tapers back when we have big drops in the market because traders are just a little bit more nervous and a little bit less apt to be greedy and to jump into big positions. There’s a little bit more fear in the market in general. So this has been a really interesting month for me because I’m finishing here my fourth red day of the month. What’s kind of crazy is that this is only the sixth day. So I’ve got four out of six days this month have been red. So I’m finishing the day today down 3,200 bucks. It’s definitely a little big disappointing just to have such a slow start. Last month, I started in the red and that was the first day of the month and by the end of the week, I was well into the green and from there just continued to surge forward. This month, I’m just kind of grinding in the red. I’d lost 7,500 on the first day of the month, made back 26 then lost 47, made back 36, lost 1,500 and then lost 3,200. So right now, I’m down like $11,000 on the month. Again, I was recouped some of that but now I’ve given it back. So 11K on the month is kind of crazy since I made $117,000 last month. I mean, it’s such a big swing right now from having 15, $20,000 days to just kind of having these small losses. I mean, $3,000 is relatively small but it’s just back to back to back losses. I was kind of watching TVIX here. It’s the only thing that I kind of had on the watch if the market does break low of day. We’re now at 366 points in the red. 26431 was the low. The thing with TVIX is that it goes up when the market goes down. It’s inverse. One of the challenging things about it is that fact that it can be a little bit delayed. It’s not exactly inverse to the market. Sometimes the market can drop and TVIX is flat. Sometimes the market pops up a little bit and TVIX drops a lot. So it’s not a perfect inverse. There’s a little bit of fluctuation there. I was watching it around this area but the market is so choppy that we dropped down, we popped back up, we’d drop back down and we’re talking about 100 point swings today. I mean, these are big swings from being being 360 to down 250, 270. So this is a difficult market to trade in. The safest thing to do is really just try to reduce your risk and not be as aggressive. One of the things that I did today which was a mistake is that I was a little bit too, well, I’m not going to say too aggre … I was maybe a little too aggressive on BSPM. You could see here’s my PnL. So BSPM, I really thought this looked decent for a breakout. It was continuing yesterday’s high but this is how it opened. Three red candles in a row, really big red volume and so it’s no wonder that I lost money on it. I got in it at right around 4.60 and it squeezed up to a high of 4.89. I added at 4.86 thinking it was going to break over a high of day and that didn’t end up happening. So I ended up getting stopped out as it dropped back down and I think right now we’re in the market where and the market is almost down 400 points here, we’re breaking low of day on the spy. We’re at a point now where my instinct to add is not really helping me. We’re not in a market where I can aggressively add and add to positions the way I could last month. Last month, if I was up 50 cents with 10,000 shares, I would add another 5,000 shares or even 8,000 shares, get myself up to 18, 20,000 shares because there was a good chance it would keep going higher. Right now when I do that, it comes back down to breakeven. The problem is stopping out breakeven with 18,000 shares is very difficult because you get slippage. That’s what happened on BSPM. I had 12,000 shares but if I had just taken my original 10,000 and sold it when I was up 30 cents, it would have made 3,000 bucks. I would have made money, instead I added thinking I had home run potential and I got stopped out for a loss because of slippage. I look at the chatroom and I see you guys who take the same trades as me who are green and it reminds me that I’m not losing money because I don’t have the right idea or I’m not taking decent trades, I’m losing money because I’m being too aggressive. I giving back profit. The thing is, being aggressive is why I made $117,000 last month. If I hadn’t been aggressive, I wouldn’t have had those profits. Being aggressive right now, I’m kind of in a grind. I’m down whatever, 10,000, 11,000 on the month so it’s a little bit of a pull back. But at the same time, being aggressive is the reason I’m up over 107,000 or 106,000 on the year and it’s only February 8th. So you got to take the good with the bad or the bad with the good. I mean, it’s just it is what it is. You can’t separate those two. It’s hard and I say that and even as I say that, it’s hard because I am feeling a little bummed out. I don’t like being red on the month. I don’t like having four out six days where I’m red. It is a little frustrating that when I’m getting into these trades, I’m thinking they have home run potential and I’m positioning myself for a home run and then I get stopped out. With my average on BSPM, whatever, 4.60, if this had gone and broken over 5 and gone to 5.20, it would have been a $6,000 winner easily, six, $7,000 winner. You guys know, last month, my average winners were big. I had 11,000, 8,000, 4,000, $7,000 winners. I mean I’m looking at my PnL right here. I had a streak of, I don’t know, it’s like 20 consecutive green days where I made 120,000 and then I had the loss on the beginning and the loss on the end of it. So it’s right now, I’m having a little bit of a hard time adjusting to not trying to have those big types of wins. The thing is, no, I see your comment there that I had 100K being aggressive in January. I could lose 100K being aggressive in February. That’s not true because my average losses aren’t that big. Being down $3,000 here today, even if I lost $3,000 a day on average, for the next 20 days, I wouldn’t lose 100 grand. I’m not going to lose 20 days in a row. That would be a unthinkable losing streak. I mean, I’ve never had a losing streak like that. It would be insane. So yeah, I’m having a little bit of a draw down right now. But this draw down that I’m experiencing isn’t any different from the draw down that I experienced last year. Just to reference that, I’ll log in here to Trader View so you guys can just see the stats. It’s important to keep things in perspective. That’s the value in tracking your trades whether it’s in Trader View or somewhere else because you can go back and you can say, “Well, is this historically normal for me to have this type of draw down?” If the answer is yes, then there’s no reason to get bent out of shape. If the answer is no, this is abnormal. This is a much bigger draw down than I’ve ever experienced or something like that then yeah, it’s time to make some bigger adjustments. I don’t know why the date is not working here. Let’s see here. Let’s go back to January, December 31st. All right. So let’s see. We go to detailed. I’m trying to remember where we have win-loss expectation. Yeah, so cumulative draw down. This was last year. My biggest draw down was $20,000. So I had a draw down. When I say draw down, I mean, from the most I had made in the year to the biggest pull back. So right now, my peak of 2018 was, let’s see, $122,000. 122,000 and right now my draw down is about 16,000. So I’m kind of close to where I was last year, 20,000, although this was in, when this happened, this was in May or April and at that point I was only up 110,000 on the year and it was April. It was a little bit of a slower year. But in any case, yeah, I peaked last year at 20,000 and then I came down again to 17. So this for me is, yeah, it’s getting on the higher side of the norm but it’s not anything I haven’t gone through before. So that’s why I’m not really panicking. I’m just kind of like, “Yeah, this is just the natural fluctuation that I experience as a trader.” So right now, the market is down 415 points. Continuing to see the selloff. TVIX is up at 11.78. The problem with TVIX is that I can’t really be aggressive on it because in light speed, it’s not marginable. It says I have to use 100% of my cash which means I can only buy about 3,000 shares of it. So for me, 3,000 shares, even if I make 30 cents on it, it’s not going to put a big dent in helping me recover my day. If we do see a bigger flash in the market then I might be more inclined to take a stab with 3,000 shares but it’s just doesn’t give me as much potential. They’re doing that to reduce the risk that traders are going to blow up their accounts on TVIX. So it’s smart that they’re doing that. But for me it’s, I guess, one of the draw backs of having recently taken $100,000 of profit out of my account. I took all this money out of my account. I paid myself for the month of January and one of the reason I pay myself is so kind of like you said, I cannot lose 100 grand this month because I don’t have that much money in my account. It’s just not possible. I am limited on my downside because I’ve taken profit. It’s important to do that. It’s important to pay yourself on a good month. Then yeah, when you have a bad month, because you drew out money, you already know you only have about this much before you just either have to stop trading or you make a big adjustment in share size or something like that. So for me, this is definitely a little bit of a grind. It’s not what I was expecting for February. Last February was my best month ever and it was the best month until I broke that high in November. So it’s surprising that February has been as slow as it has but at the same time, these are the fluctuations of the market. The tide changes. We are experiencing a pretty rapid change of tide here, change of current. My instinct on BSPM was to be aggressive and that wasn’t right. I think that I need to make and adjustment there, that instinct to keep adding, I probably shouldn’t do that until we start seeing more stocks really open up and I kind of … I guess I’m sort of like going down, I go down with the ship in a way. Like I push it until, I try to keep getting winners until it’s just painfully obvious that I have to stop. It’s like I keep thinking we’re going to get the boat upright until I’m swimming or I’m waste deep in the water and that’s like, “I guess this is the reality I have to adjust.” I hate making that adjustment because I don’t like … Who likes slow markets? No one does. We want to be able to make $5,000 a day every single day but it’s not realistic and you do have to be able to adjust. So today is the 27th day of the year. I’m averaging $3,900 of profit per day. Even despite these losses. I’m about 106,000 on the year. Got a little bit of work cut out for me for February. First goal is to get myself back into the green. Second goal is to try to finish up 10,000, $20,000 if I can. But if this is a slow month, it’s not a big deal. Last year, I had two months where I closed in the red. I was red in May and … Sorry, I was red in April and I was red again in September. Both on those months I closed down four, $5,000 and I still finished the year with 335,000 in my small account. Another 40,000 in my big account and another 150,000 in my long term account. So it was still an awesome year despite those pull backs. So I want to remind you guys, right now, if you’re a beginner trader who’s just getting into the market, I want you to think of this as an opportunity to study. You’re almost getting a little bit of a reprieve, a little bit of a break because you don’t have to feel FOMO. You don’t have to see these huge opportunities going by day after day and you’re missing them. Instead right now, you can focus on training. You can study. 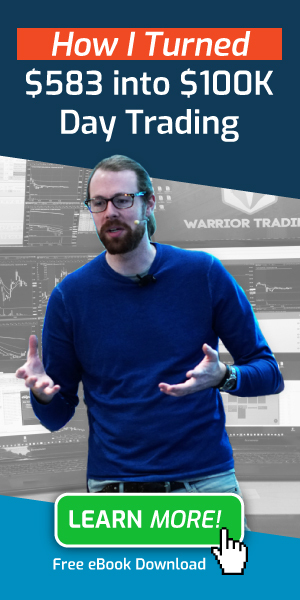 You can trade a little bit in the simulator and by the time, two weeks from now or whatever it is, that we really start to see things pick up, you’re going to trained, you’re going to be prepped and you’re going to be able to capitalize on that opportunity. 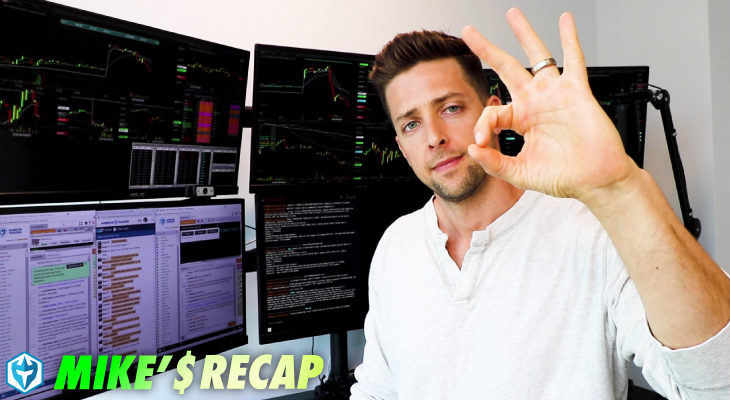 So right now, it’s just a time to focus on discipline, study, study, study and I would go back and study all of the big momentum stocks from January, go back and watch my midday recaps for all of January on those big days and look, what was I doing right, how was I trading then, what was working and then when we start to see that happen again, you’ll be able to capitalize on it. So that’s the game plan right now for me. Tomorrow is Friday. Probably not going to recoup the losses on a Friday but you never know. I’ll just try to make a little bit of money. I’ll try to refrain from adding to positions. Doubling works really well on a strong market but in a weaker market, it gives back profit and it increases losses. So I’ll try to refrain from adding. I’ll just take my core position and hold it as long as I can and we’ll see how that treats me for the next couple of days. It’s just again, you got to kind of be able to adjust and I hate having to adjust to a weak market. I was really trying to fight it. But I think I just need to make that little pivot and it’s probably for the best and then when things start to pick up, I’ll probably miss the first couple of stocks that really go crazy because I’ll be trading conservatively. But I’ll be able to taper back up and to rally back up once I start to see good opportunities. So that’s the problem though is I will miss the first one or two because I’ll still be trading conservatively. But at the same time, you miss the first two, as it starts to pick it back up but on the tail end of a hot streak, you start having red days because you’re still pushing too hard. So you have a little bit of a tail end where you’re given back profit and then you have to kind of ramp up where you’re not fully capitalizing and then things start to pick up. So that’s where we’re at right now. 27th day of 2018, $105,000 of profit.this is still the best start I’ve ever had on a year despite this little bit of draw down that I have right now. Look, the market’s down like 2,000 points off the highs. I mean, we are in a pretty crazy market right now. Maybe I should have been faster to just pull back on being aggressive. But whatever. Today, I’m probably going to be done. I might trade TVIX but I sort of doubt it. I just don’t see that being an easy one for me to trade especially with marginal restriction. All right. So anyways, that’s it for me. 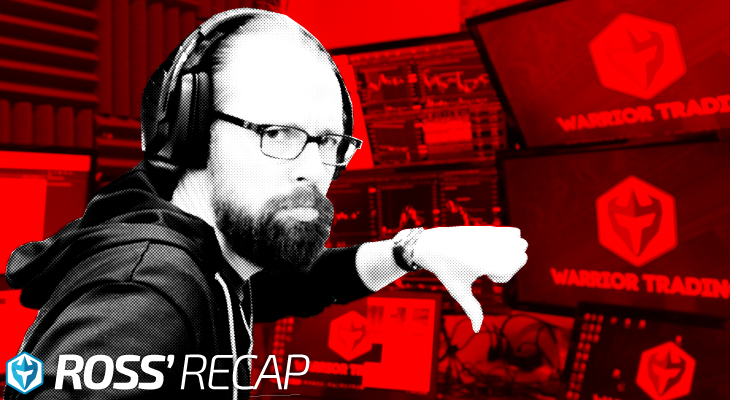 We’ll be back at it first thing tomorrow morning, pre-market analysis and hopefully we get a couple of nice opportunities. But I’m just going to set the goal at $1,000 a day. I’m not going to try to swing for these four, $5,000 winners because they’re not happening. So I just got to get myself on base, get myself back in the green. Kind of get myself a couple of green days under my belt and that will be it for me. So all right, that’s my game plan and I’ll see you all first thing tomorrow morning. If you’re still watching, you must have really enjoyed that video. So why not subscribe and get email alerts anytime I upload new content. 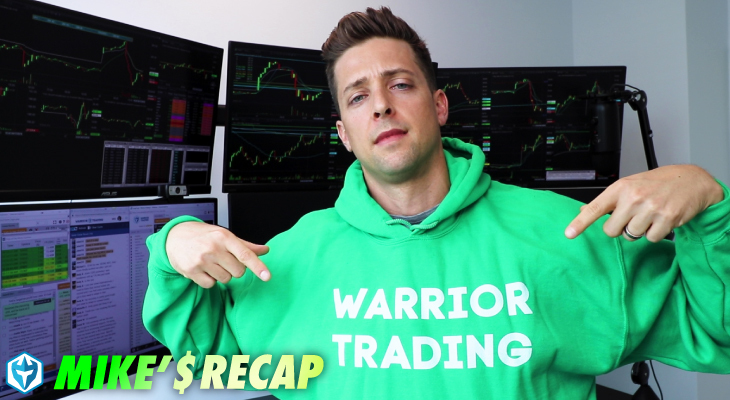 Remember, when you subscribe, you become a member of the Warrior Trading family.